Don't toss your wool garments in with the jeans and T-shirts. 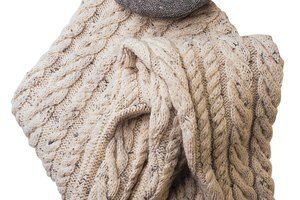 Wool garments feel luxuriously warm and comfortable, but they're also frighteningly easy to shrink in the dormitory washing machines. If your favorite wool garment now looks small enough to fit a toddler, don't toss it in the thrift store donation bag just yet. By soaking and conditioning the delicate wool, you'll soften the garment enough to stretch it back into its original shape. Fill a tub or clean sink halfway with lukewarm water. Add a few drops of mild liquid laundry detergent or hair conditioner. Turn the garment inside out and submerge it in the water. Knead the garment gently to work the conditioner or detergent into the fibers. Don't squeeze the wool or handle it roughly. 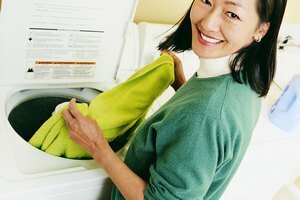 Let the garment soak for up to 15 minutes and then remove it from the water. Press down on the garment with your hand to expel water. 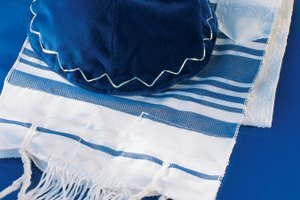 Do not wring or twist the garment. Rinse the garment under clean water if it feels soapy and press the excess water out of it again. Drape the garment over the side of a sink or tub and wait for it to stop dripping. Lay the garment flat on a thick white bath towel. If the garment still feels wet, blot it with a second towel to soak up the water. Stretch the garment back into shape and then let it dry. When the garment dries, it retains the shape and size to which you stretched it. If you put a garment labeled "Hand Wash" or "Dry Clean Only" in the washing machine, you probably cannot fix the shrinkage. King, Melissa. 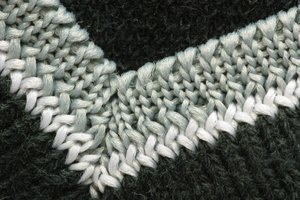 "How to Stretch Wool After Shrinking It." Synonym, https://classroom.synonym.com/stretch-wool-after-shrinking-7997.html. Accessed 23 April 2019.